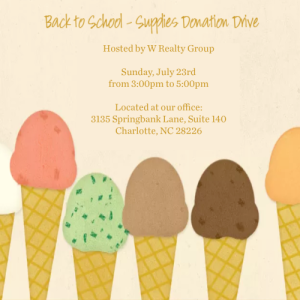 Please join us this Sunday, July 23rd between 3 and 5pm for our annual School Supplies Drive and Ice Cream Social! We are once again partnering with A Child’s Place to collect donations for students in need in the Charlotte area. After doing some good, cool off with some delicious ice cream from one of our favorite local ice cream trucks, Sticks and Cones, it’s our treat! Click the links below to learn more about the even. If you’re interested in attending the event, RSVP to the evite below! Stay tuned for next month’s W Update!